NEATCONTAINERS are BETTER than ordinary containers and we can prove it. Watch below and we will show you how you can make your life easiers and more organized. Regular containers have to be unstacked to get at what you want. Try jerking out a lower unit and the rest come tumbling down. NEAT CONTAINERS slide out like a drawer so you can access what you want immediately without Olympic floor exercises. When you stack Neat containers you can remove ANY container from ANYWHERE in the stack WITHOUT unstacking OR collapsing to get to what you want fast. So if you have a large stack of containers there is no more digging and lids flying all over - simply slide out the desired container - that's it! And they are clear so you can see what's inside! It's all due to our patented design. 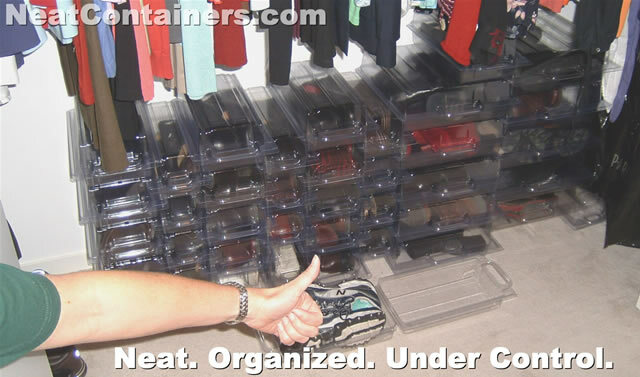 Our containers are so handy, we've even been recognized by the National Association of Professional Organizers (NAPO). Watch our first video below left and see how simple, easy and cost effective storage and organizing can be - we guarantee it! ALL of our containers are MADE IN THE USA. "Shoe Storage at its Best"
-Desiree Stimpert, About.com Shoe Expert // Click here for her review. SHOE Storage: Space Saving Convenience for 1 or 1,000,000! The minutes you spend watching this video will save you HOURS. - > In Style with Professional Organizer Mary Pankiewicz. Click the play button > to hear unpaid testimonials in the customer's own voice and words. "There is no other word for these containers than NEAT. I have an enormous shoe collection and could rarely find a matching pair before I found this system. Walking into my closet was actually becoming hazardous and some very expensive shoes were getting damaged. The total cost of the shoe pods represents a small percent of what one pair of these shoes cost. Now i can walk into a closet and actually see about 200 pair of shoes at a glance. I have already placed another order. Thank you for the great product." I started with the 30 piece shoe starter kit and have since then ordered 2 more times! I envision organizing all my purses that are stacked in a shelf as well as stopping the pile of shoes near my bed! I will put neat containers under the bed, in the closet under clothes and where they are now, up against the closet wall! They're the best organizing system I've ever seen and they are affordable! Neat Containers are SOOOO simple to set up and are modular so you can adapt them to almost any space! Get started with this clip. Great product! My closet now looks neat and so are my shoes. Love it! "I got them today. They are great! I can finally find everything in my closet. I'll tell everyone that I know about your site." These inexpensive pods will last decades. 30 Money back guarantee. Watch the video below for a durability demonstration. I love my NeatContainers! They have turned my small cluttered closet into my small well organized closet. 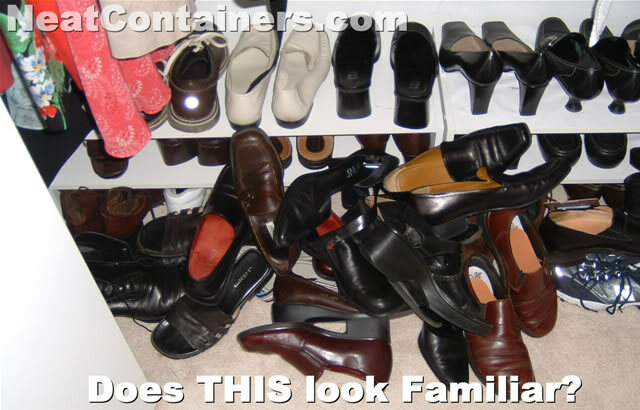 Before NeatContainers I couldn't even walk into my closet without stepping on shoes. Then there was the switching shoes in and out of shoe boxes twice a year when the seasons changed. Not to mention opening a box and realizing I already had shoes just like the one's I'd bought a few months earlier. Now finding the shoes I want to wear is a snap and putting them back is a pleasure! I can't live without them! I CAN SEE MY SHOES STACKED! I CAN FIND ANY PAIR OF SHOES! Look at what I want in seconds, pull out container a for easy access, and I'm still organized! They come in 3 widths: 4", 6" and 12"
Add 2" to each for the overall dimension. Ready to buy? Give us a toll free call at 877-Neat-Pod (877-632-8763) to learn more or place and order. Why not give us a try and experience how easy and N E A T shoe storage and organizing can be?